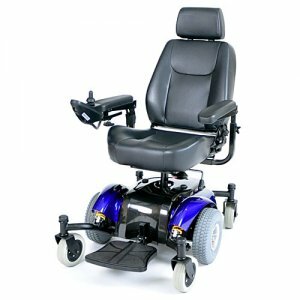 The Intrepid Mid-Wheel Electric Power Wheelchair offers a durable and reliable performance power chair in one package. The captain seat with deep contoured cushions and backs provides superior comfort while maintaining a high level of durability. Almost everything on this chair is adjustable; from a reclining backrest with adjustable headrest, to the height of the chair at four available increments. The flip up armrests, which allow easy transfer, are height and width adjustable and can even be removed. The controller can be fitted onto either armrest allowing you to operate the chair with ease if you have limited dexterity. The mid wheel drive gives way to an outstanding turning radius of 18" allowing you to navigate nimbly through the sharpest corners and the Quadra Spring suspension offers a smooth, stable ride. Tight 18" turning radius is ideal for indoor maneuverability. Unique Quadra Spring suspension provides ultimate in smooth-riding stability. Standard swivel Captain's seat with fold-down backrest and adjustable height headrest. Standard seats are height adjustable and feature 25 degrees of recline. Removable flip-up armrests are height, width and angle adjustable. Adjustable length controller mount can be fixed to either the left or right armrest and can be fitted with an optional swingaway arm. Standard positioning belt for added security. Standard flip-up footplate with adjustable height and angle. Footplate includes textured, skid-proof cover. Mid wheel drive for tightest turning radius, perfect for indoor use. 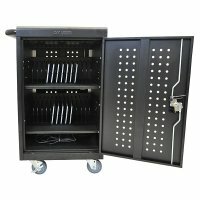 Programmable controller allows you to tailor the chair's performance to each user. Single-plug controller easily fastens into port on rear of chair. Front Wheels: 6" x 2"
Rear Wheels: 10" x 3"